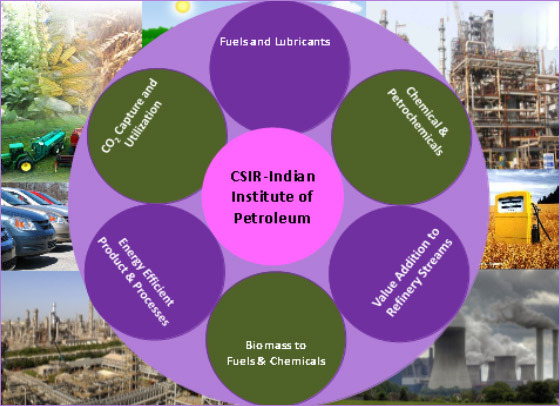 The Indian Institute of Petroleum, one of the constituent laboratories under the umbrella of Council of Scientific & Industrial Research (CSIR), was established on September 26, 1960. The Institute has continued its efforts to grow into an internationally renowned R&D organization, providing quality research and innovative technologies for the national and international market place and to produce technical support to the industry. Accredited with ISO 9001: 2015 certificate, Institute is devoted to multidisciplinary areas of Research and Development in the downstream sector of hydrocarbon and related industry. Institute has experience and expertise in the process and product development (lab / bench / pilot scale), process scale-up, process design, process optimization, process improvement and revamping. The institute is also involved in techno-economic feasibility studies, technology assessment, energy audit and conservation in chemical plants, vehicular pollution abatement, use of alternative fuels in IC engines and product characterization. Some of IIP’s major activity areas are Petroleum Refining, Catalytic Refining and Catalysis, Separation Process, Solvent Extraction, Adsorption, Membranes, along with evaluation and characterization of Lubrication Oil and Modified Bitumen and Carbon Materials. Other areas of expertise are Thermal Conversion Process, Modeling and Simulation, Chemicals /Petrochemicals, Intermediates and Additives for relevant industries. Process and product development for Specialty Chemicals, Petrochemical intermediates, Bio-processing of petroleum streams; Fuel, Lubes and Chemicals from Biomass are recently introduced. Institute has developed a large number of processes and technologies and many of them have been transferred to the industry. Almost every refinery in the country has a product/ technology licensed by the institute. Test techniques are also developed for evaluation of petroleum products with BIS specifications. The institute has also established global tie-ups for contract research and technical services and has filed/granted patents in India and abroad. Large numbers of research papers are published in reputed International and National journals. The institute is bestowed with many prestigious awards in recognition of excellence in various fields.